Please select the color and length you need. 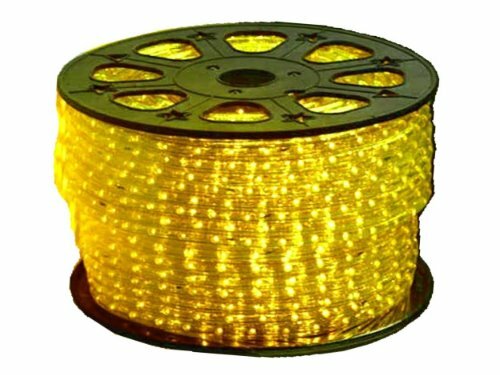 Brand New, Highly durable, *Weather-proof, Round, Clear, PVC rope ... with Long-life, Cool-burning, Energy-saving, Sub-miniature, LED bulbs. Flexible to bend into shapes. No Flicker/Smooth Glow. Can be cut every 1 meter (3.28 ft.). Easily Installed. For Indoor or Outdoor use. Used for anywhere soft incandescent lighting is needed such as Decorative Lighting, Sign Lighting, Corners, Ceilings, Staircases, Decks, Driveways, Boats, Galleries, Clubs, and Parties. - LED bulbs spaced every 1"
- 0.0145 amps per meter (0.0044 amps per foot). - 1.74 watts per meter (0.53 watts per foot). - Actual Colored LED's with Clear PVC Tube for a smooth, soft incandescent color. - Some sellers use white LED's with colored PVC Tube to create the desired color. *IMPORTANT: The PVC rope lights alone are weather proof. However, the area where the rope lights attach to the power cord, the power cord itself and the end cap are not weather proof and should never be exposed to the weather unless it has been properly weather proofed. It is the responsibility of the buyer to make sure the entire length of the rope lights and the power cord is properly weather proofed should these light be used Outdoors or near any water/moisture. Please keep in mind that the PVC rope that the lights are encased in can be cut or damaged in many ways including but not limited to stepping on them which would expose electrical wires and cause a potential fire hazard should moisture get near the damaged area.